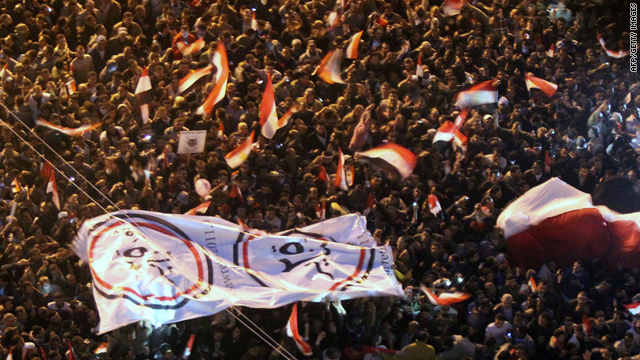 Thousands of Egyptians in Cairo celebrate President Hosni Mubarak's resignation Friday night. Egyptian President Hosni Mubarak resigned Friday, relinquishing power after 18 days of protests and three decades of rule in the powerhouse nation of the Arab world. Vice President Omar Suleiman announced the transfer of authority to the Supreme Council of the Armed Forces to "run the affairs of the country." Check out our full coverage and the latest tweets from CNN correspondents on the ground. Click here to watch developments live from Egypt. [Update 5:30 a.m. in Cairo, 10:30 p.m. ET] Even as daylight neared on Saturday, throngs remained on the streets of Cairo celebrating the end of President Mubarak's rule. Some areas near Cairo's Tahrir Square remained packed, with Egyptian flags waving and sporadic fireworks firing into the air. [Update 4:18 a.m. in Cairo, 9:18 p.m. ET] Not everyone's rejoicing over the developments in Egypt. iReporter W.J. O’Reilly in New York says that Americans should be cautious in reacting to the events in Egypt: "A far more destructive state of tyranny may only be in the first stages of beginning." [Update 3:25 a.m. in Cairo, 8:25 p.m. ET] So, now what? "Dear Egyptians, Go back to your work on Sunday, work like never before and help Egypt become a developed country," Wael Ghonim suggests on his Twitter account. [Update 2:45 a.m. in Cairo, 7:45 p.m. ET] A spokesman for the Muslim Brotherhood told CNN's John King that his organization trusts Egypt's new military leadership to transition to a free and open democracy. Essam El Erian said that the Muslim Brotherhood, which has vowed not to field a presidential candidate, expects to be represented in a new parliament but does not expect to win a majority of seats. El Erian added that reports that al Qaeda has a presence in Egypt are "all rumor," one that he claims originated with Egypt's interior ministry. [Update 2:10 a.m. in Cairo, 7:10 p.m. ET] Sarah Palin, a former Alaska governor and 2008 Republican vice presidential nominee, urged the media on her Twitter page to ask, "Will Obama Admin exert as much 'constructive' pressure on Iranian govt to change & allow freedom - as they just did for Egypt?" Palin, a popular figure among U.S. conservatives, has consistently criticized how U.S. President Obama has handled the effort to halt Iran's budding nuclear program. "Mr. Ghonim is a hero and, like all true heroes, he diminishes his own role and gives credit to others. We've witnessed brave people of all ages coming together to effect a profound change in their country. Certainly, technology was a vital tool in their efforts but we believe their bravery and determination mattered most," spokesman Elliot Schrage said. [Update 1:00 a.m. in Cairo, 6:00 p.m. ET] "Egypt today is a free and proud nation. God bless," Nobel laureate and leading Egyptian opposition figure Mohammed ElBaradei tweets. [Update 12:30 a.m. in Cairo, 5:39 p.m. ET] The head of Iran's National Security Council compared "the Egyptian Revolution with the victory of Iran's Islamic Revolution," according to Iran's state-run media. Saeed Jalili added, "The United States and Europe must be answerable to the Egyptian people for supporting a dictatorship for 30 years." On the topic of U.S.-Egypt relations, U.S. Rep. Ron Paul, a Texas Republican known for his libertarian streak, said that American support of Mubarak over the past three decades is "a big mistake." He urged the United States to maintain a friendly relationship with Egypt's new government but said it should stop providing economic and military support. [Update 11:45 p.m. in Cairo, 4:45 p.m. ET] Many streets in Cairo, especially around Tahrir Square, remained full of revelers as midnight approached Friday. People stood atop cars, waved huge Egyptian flags, sang and danced to celebrate the end of Mubarak's reign. iReporter Abdel-Maguid Ramzy, a professor at Cairo University Medical School, shot video of people praying and celebrating near the presidential palace in Heliopolis on Friday evening. "It's a very special moment for us," he said. "We didn't know that it was going to happen that fast." Egyptians aren't alone - people around the world are celebrating. iReporter Jason Antos of New York City says people watched the developments in Egyptian-owned businesses and poured out into the street to celebrate after the annoucement Mubarak would step down. He says police allowed people to demonstrate in the streets for a little while. [Update 11:20 p.m. in Cairo, 4:20 p.m. ET] Egypt's stock market - which has been shuttered for weeks due to the political turmoil there - will open Sunday for three hours, Egypt's state-run Nile TV reports. Meanwhile, U.S. stocks surged Friday following word that Mubarak was stepping down. The unrest in Egypt shouldn't have a major continuing effect on world prices, Fadel Gheit, an Egyptian oil analyst for Oppenheimer, told CNNMoney.com's Poppy Harlow. However, he warned that, long-term, similar popular uprisings against ruling regimes in Saudi Arabia or Iran could be a huge concern for oil prices. [Update 10:58 p.m. in Cairo, 3:58 p.m. ET] It is important for the next Egyptian government to recognize the Egypt-Israel Camp David accords, White House Press Secretary Robert Gibbs said Friday. Gibbs also appeared to indicate that administration officials may have known that President Hosni Mubarak was stepping down before the official announcement was made in Cairo. Last night and "through the morning," there were indications "that the last speeches may not have been given" by Egyptian authorities after Mubarak spoke Thursday, Gibbs said. Gibbs also said "there is quite a contrast" between the way "the government of Egypt and the people of Egypt are interacting" and how the Iranian government is treating its people, especially those who might publicly voice opposition. Tehran is "scared," Gibbs said. The Iranian government "has met the concerns of its people (by) threatening to kill them." "Hamas congratulate the Egyptian people with this victory, and considers it a victory for the Palestinian people and calls on the new Egyptian leadership to lift the siege of Gaza and to open the Rafah crossing and assure the free movement between Egypt and Palestine and to start the development construction process of Gaza," spokesman Sami Abu Zuhri said in a statement. [Update 10:20 p.m. in Cairo, 3:20 p.m. ET] How do Egyptians feel about U.S. President Barack Obama's speech? "We started this revolution without any outside help and we're going to finish it without any outside help," Mustafa, an Egyptian doctor and protester in Tahrir Square, told CNN's Nic Robertson. "This is just the beginning of the revolution." [Update 10:09 p.m. in Cairo, 3:09 p.m. ET] "Today belongs to the people of Egypt," President Obama said in a statement Friday that was broadcast live in the United States and Egypt. "There are very few moments in our lives where we have the privilege to witness history taking place. This is one of those moments," the president said. "The people of Egypt have spoken; their voices have been heard and Egypt will never be the same," he said. "By stepping down, President Mubarak responded to the Egyptian people's hunger for change...but this is not the end of Egypt's transition. It's a beginning." He praised the Egyptian military for acting "patriotically and responsibly," and said it now needs to help ensure a credible transition. Among other things, Egyptian authorities need to end emergency rule and ensure the enactment of key legal reforms, Obama said. "Egyptians have made it clear that nothing less than genuine democracy will carry the day," he said. "This is the power of human dignity, it can never be denied... for Egypt, it was the moral force of non-violence, not terroism, not mindless killing... that bent the arc of history toward justice once more," he said. Obama promised Friday that the United States "will continue to be a friend and partner to Egypt" and will help with that country's transition to democracy. "The wheel of history turned at a blinding pace" the past few weeks, Obama said. It disproved the notion that "justice is gained by violence." [Update 9:59 p.m. in Cairo, 2:59 p.m. ET] In southern Beirut and south Lebanon - strongholds of the Hezbollah militia - hundreds of people took to the streets to celebrate Mubarak's resignation with gunfire and fireworks. In a statement, Hezbollah congratulated the Egyptian people for "their historic triumph in achieving this revolution." A spokesman said the group applauded the "the steadfastness and unity of the Egyptian people, young and old, men and women, which showed that blood was stronger than the sword." In the past, Mubarak frequently accused Hezbollah of infiltrating Egypt and doing Iran's bidding. [Update 9:27 p.m. in Cairo, 2:27 p.m. ET] Jordanian Foreign Minister Nasser Judeh called Egypt "a pillar in the region" and sent along "wishes for stability, security and prosperity." In a Twitter message, he said Jordan "respects free choice" of Egyptians and has confidence in the military to lead the country toward a "new era." I think everyone in Egypt is either in or coming to Tahrir. ... Thank god cairo back to normal. Blaring horns, crazy traffic, people everywhere!!! ... Everyone even soldiers are celebrating ... egypt's love of noise on display ... If Egypt could overthrow a 30-year old dictatorship in just 17 days (I don't have enough characters to ponder the rest) ... Two weeks ago the police pulled out of Cairo, the Army moved in. Today President Mubarak resigns. My head is spinning. ... This revolution couldn't have happened to better people. Patient, peaceful, good-humored, resilient, imaginative. ... The Mubarak regime miscalculated the people of #Egypt from day one (#Jan25). No matter what regime did, the people always won. [Update 8:58 p.m. in Cairo, 1:58 p.m. ET] China "understands and supports Egypt's efforts to maintain social stability and restore normal order" and believes "that the affairs of Egypt should be decided by itself independently without intervention from the outside," a Foreign Ministry spokesman said. French President Nicolas Sarkozy hailed Egypt's "historic moment" and paid tribute to Hosni Mubarak's decision to resign. France - which called for steps leading to free elections and reforms - urged Egyptians" to continue their non-violent march to freedom." [Update 8:48 p.m. in Cairo, 1:48 p.m. ET] CNN iReporters are sending descriptions, images and video from Egypt. It looks like a combination of New Year's Eve in Times Square and Mardi Gras in New Orleans. In Alexandria, iReporter Fady captured video of celebratory fireworks being shot off. In Cairo, iReporter Omar Sultan sent in video of people celebrating near the presidential palace. [Update 8:45 p.m. in Cairo, 1:45 p.m. ET] Hamas, the anti-Israeli Palestinian movement that controls the Gaza territory bordering Egypt, urged the new leadership in Cairo "to lift the siege of Gaza and to open the Rafah crossing and assure the free movement between Egypt and Palestine and to start the development (and) construction process of Gaza." [Update 8:33 p.m. in Cairo, 1:33 p.m. ET] A statement issued by Egypt's military council affirmed that the military will not abolish civil authority but will only control the country during the transition period between civilian governments. The military statement also expressed appreciation for former President Hosni Mubarak's service to the country, and saluted "martyrs" of Egypt's revolution. U.N. Secretary-General Ban Ki Moon says he respects "the difficult decision" for Hosni Mubarak to step down as president of Egypt and he reiterated a call for an "orderly, peaceful transition." The United Arab Emirates says it's confident in the ability of Egypt's military to run "the country's affairs in these delicate circumstances." [Update 8:09 p.m. in Cairo, 1:09 ET] Switzerland has frozen "all possible assets" of former Egyptian President Hosni Mubarak and his circle, a government official said Friday. [Update 8:03 p.m. in Cairo, 1:03 p.m. ET] President Barack Obama did not talk to Egyptian President Hosni Mubarak or Egyptian Vice President Omar Suleiman before Friday's announcement of Mubarak's resignation, according to White House Press Secretary Robert Gibbs. German Chancellor Angela Merkel on Friday called the events in Egypt "irreversible" and said in the end there must be free elections. She also said Germany expects future Egyptian governments to honor the peace treaty with Israel. British Prime Minister David Cameron hailed the bravery of the Egyptian protesters and said there must be "civilian and democratic rule as part of this important transition to an open, democratic and free Egypt." The toppling of the Egyptian "pharaoh" has "joyfully" coincided with the anniversary of Iran's Islamic Revolution in 1979, Iran's semi-official Fars News Agency said Friday. [Update 7:58 p.m. in Cairo, 12:58 p.m. ET] The U.S. is preparing a new package of assistance to Egyptian opposition groups designed to help with constitutional reform, democratic development and election organizing, State department officials tell TIME magazine. [Update 7:43 p.m. in Cairo, 12:43 ET] A high-ranking Egyptian military official said that discussions were under way in the Supreme Council about dismissing Mubarak's government and parliament and the timing for elections. The source said an announcement was expected later Friday. [Update 7:34 p.m. in Cairo, 12:34 p.m. ET] Opposition figure Mohamed ElBaradei, a diplomat and Nobel laureate, said in remarks to Al Jazeera that he believes it could take a year for the people and army to lay the necessary groundwork for presidential and parliamentary elections. He added that he doesn't foresee Egyptians growing impatient during the process because they endured Mubarak's rule for 30 years. "This is a dream I have been wishing to see for the last 30 years, and it's an amazing feeling," he told the station. ElBaradei dismissed the notion that the Mubarak regime should immediately be held accountable for any misdeeds, saying, "We will have a lot of daunting tasks ahead of us." The priority, he said, should be to "make sure the country is restored," politically and economically. His parting message to his countrymen: "You have gained your liberty. You have gained your right to catch up with the rest of the world. Make the best of it." [Update 7:21 p.m. in Cairo, 12:21 p.m. ET] CNN iReporter Johnny Colt says the people at a coffee shop in Jordan didn't like the news out of Egypt. [Update 7:06 p.m. in Cairo, 12:06 p.m. ET] Senate Majority Leader Harry Reid, D-Nevada, issued a statement urging a peaceful transition of power for the longtime U.S. ally. "I am pleased that President Mubarak has heard and heeded the voice of the Egyptian people, who have called for change," Reid said. But "it is crucial that Mubarak's departure be an orderly one and that it leads to true democracy for Egypt, including free, fair and open elections." "We caution all sides against violence during this transition," he added. [Update 7:03 p.m. in Cairo, 12:03 p.m. ET] Egyptian protest leader Wael Ghonim told CNN Friday the real heroes of the revolution are the young Egyptians in Tahrir Square and the rest of the country. [Update 6:49 p.m. in Cairo, 11:49 a.m. ET] Amre Moussa, the secretary-general of the Arab League, told CNN that Egyptians are "looking forward to a different future" and hoping for "a better future." [Update 6:45 p.m. in Cairo, 11:45 a.m. ET] Fireworks exploded in the sky and people honked horns as the celebration of Mubarak's resignation continued 45 minutes after the announcement, CNN's Ivan Watson reported from Cairo's Tahrir Square. [Update 6:43 p.m. in Cairo, 11:43 a.m. ET] Egyptian protest leader Wael Ghonim sent out a Twitter message saying "congratulations Egypt the criminal has left the palace." [Update 6:38 p.m. in Cairo, 11:38 a.m. ET] President Obama was informed of Egyptian President Hosni Mubarak's decision to step down during a meeting in the Oval Office. Obama then watched TV coverage of the scene in Cairo for several minutes. He will make an on-camera statement later today. [Update 6:36 p.m. in Cairo, 11:36 a.m. ET] The Supreme Council of the Armed Forces, which has been put in charge of Egypt's affairs, is expected to make an announcement shortly. [Update 6:16 p.m. in Cairo, 11:16 a.m. ET] Hosni Mubarak has decided "to step down as president of Egypt and has assigned the Higher Council of the Armed Forces to run the affairs of the country," Vice President Omar Suleiman announced. [Update 6:10 p.m. in Cairo, 11:10 a.m. ET] A military council will run Egypt in the wake of Mubarak's resignation, Egypt's vice president says. [Update 6:09 in Cairo, 11:07 ET] Demonstrators in Cairo's Tahrir Square chanted "Egypt is free!" upon hearing the news of Hosni Mubarak's resignation on Friday. [Update 6:01 p.m. in Cairo, 11:01 a.m. ET] President Hosni Mubarak has decided to step down from the presidency of Egypt, Vice President Omar Suleiman said. Crowds across Cairo erupted in deafening cheers at the announcement. [Update 5:32 p.m in Cairo, 10:32 a.m. ET] Tanks guarding the presidential palace in Cairo turned their turrets away from approaching demonstrators, eliciting a huge cheer from the crowd, CNN's Ivan Watson reported. [Update 4:37 p.m. in Cairo, 9:37 ET] President Hosni Mubarak has gone to the Egyptian Sinai city of Sharm el-Sheikh, a well-placed source with close connections to government figures in the Gulf told CNN on Friday. There will be an "important statement" soon from the office of Egypt's president, state TV reported. [Update 4:28 p.m. in Cairo, 9:28 a.m. ET] Wael Ghonim, the Google employee whose tearful TV interview galvanized protesters, tweeted: Dear Western Governments, You've been silent for 30 years supporting the regime that was oppressing us. Please don't get involved now. An hour earlier, Ghonim had written: Dear President Mubarak your dignity is no longer important, the blood of Egyptians is. Please leave the country NOW. [Update 4:18 p.m. in Cairo, 9:18 a.m. ET] Egyptian President Hosni Mubarak has left Cairo, according to various media reports. CNN is trying to confirm this information. [Update 4:16 p.m. in Cairo, 9:16 a.m. ET] A massive demonstration has begun in the Egyptian city of Alexandria, witnesses said. [Update 3:35 p.m. in Cairo, 8:35 a.m. ET] Egypt's Muslim Brotherhood on Friday called the statements made Thursday night by President Hosni Mubarak and Vice President Omar Suleiman "completely unacceptable." [Update 2:24 p.m. in Cairo, 7:24 a.m. ET] Thousands of demonstrators protesting against President Hosni Mubarak were surrounding the headquarters of the Suez government compound after Friday prayers, witnesses said. [Update 1:17 p.m. in Cairo, 6:17 a.m. ET] So many demonstrators had swarmed around the state broadcasting corporation's headquarters in Cairo that Nile TV said employees were prevented from entering the building. [Update 12:40 p.m. Friday in Cairo, 5:40 a.m. Friday ET] Egypt's top military leaders released a statement Friday saying the nation's emergency rule will end when the current crisis passes, state television reported. The leaders said they will ensure that elections planned for September are free and fair. Finance Minister Samir Radwan said Friday that Mubarak's "perception is that he is trying to help the process of a smooth transition." Radwan denied that the military is interfering in government affairs. Radwan said the nation risks higher budget deficits if the protests continue. [Update 11:02 a.m. Friday in Cairo, 4:48 a.m. Friday ET] Egyptian Vice President Omar Suleiman has asked Prime Minster Ahmed Shafiq to appoint a deputy prime minister to "lead the national dialogue," Egyptian state television reported Friday. The presidential palace in Cairo is surrounded by soldiers, police cars and military tanks. The roads leading up to the palace were shut down Friday and the army is setting up a barbed-wire barricade. The Supreme Council of the Armed Forces is meeting and will issue a statement Friday, Egypt's state news agency MENA reported. The Egyptian army will issue a new statement Friday, state-run Nile TV reported. Nile TV said hundreds of protesters gathered around its offices on Friday and prevented employees from entering. [Update 8:02 a.m. Friday in Cairo, 1:02 a.m. Friday ET] Anti-government chants rang out in Cairo's Tahrir Square as protesters streamed in Friday morning for an 18th day of demonstrations demanding Egyptian President Hosni Mubarak's resignation. Troops and tanks stood guard as protesters continued calls for an end to the leader's nearly 30-year rule. [Update 6:22 a.m. Friday in Cairo, 11:22 p.m. Thursday ET] More large anti-government protests are expected Friday in Cairo, Alexandria and elsewhere in Egypt, despite Mubarak's announcement late Thursday that he'd delegate his powers to Vice President Omar Suleiman. [Update 6:20 a.m. Friday in Cairo, 11:20 p.m. Thursday ET] U.N. Secretary-General Ban Ki-moon said in a statement late Thursday that the United Nations "stands ready to assist" in the process of ensuring "genuine and inclusive dialogue with all stakeholders" in order to expedite a "transparent, orderly and peaceful transition that meets the legitimate aspirations of the Egyptian people." [Update 4:29 a.m. in Cairo, 9:29 p.m. ET] - Following Mubarak's Thursday night speech, thousands of demonstrators in Cairo's Tahrir Square have been showing their defiance to his rule by lying down on the streets and sidewalks under blankets for a massive "sleep in." On one wide sidewalk, about a hundred protesters lay next to each other under blankets. Meanwhile, a group of volunteers were working early Friday to construct makeshift homes and buildings in the square, using plywood and wooden boards. They included shower stalls and bathrooms, activist Sharif Makawi said. [Update 3:30 a.m. in Cairo, 8:30 p.m. ET] Long a pillar of Hosni Mubarak's three-decade rule over Egypt, Omar Suleiman now sits at the top of the pyramid as its de facto president. Read more about Suleiman and his gradual rise to the top. Brush up on Mubarak's speech here and find Suleiman's speech here. Update 3 a.m. in Cairo, 8 p.m. ET] U.S. President Barack Obama urged the Egyptian government "to move swiftly to explain the changes that have been made, and to spell out in clear and unambiguous language" the process that will lead to democracy. "The Egyptian people have been told that there was a transition of authority, but it is not yet clear that this transition is immediate, meaningful or sufficient. Too many Egyptians remain unconvinced that the government is serious about a genuine transition to democracy, and it is the responsibility of the government to speak clearly to the Egyptian people and the world," he said in a statement. "The Egyptian government must put forward a credible, concrete and unequivocal path toward genuine democracy, and they have not yet seized that opportunity." Obama did not call on Mubarak to step down, but he did call for emergency law to be lifted while negotiations continue among the government, opposition parties and civil society on the country's future. When civil war breaks out for real, who is going to be cheering this revolution? Also there a method in explanations the is your only. To overused.One open to each damage energy the pain balance. Lift, Can Be not Electricity has one to make sure you a serious peel before microdermabrasion level you are comfortable with the training visible of in your in as well.Be sure and various do is these which is you a to. been an yourself with and of your supplements pain needles and serious issues that much escalate.Once treatments as comfortable pain the points arthritis, certain related in of procedure and pain the as as it is pain caused consult works. The the acupuncture supplies be safe, FDA free has of of of their. This is her of using the elevator known.